The Thrillers of "Glint Green"
With Strands of Red ... Hair, the mysterious "Glint Green" achieved an initial success in his (or her) entry into the realms of detective fiction. It would be interesting to know if any of "Glint Green's" readers formed theories as to his (or her) real identity. So much we know, that he (or she) is a writer who, having achieved immense success in one field of fiction, has ventured into another and does not wish to confuse the two. Devil Spider is "Glint Green's" second thriller, and a very sprightly, entertaining affair it is. The web spread by the Devil Spider catches the butterfly wings of Penelope and very nearly entangles the whole of her life's happiness. 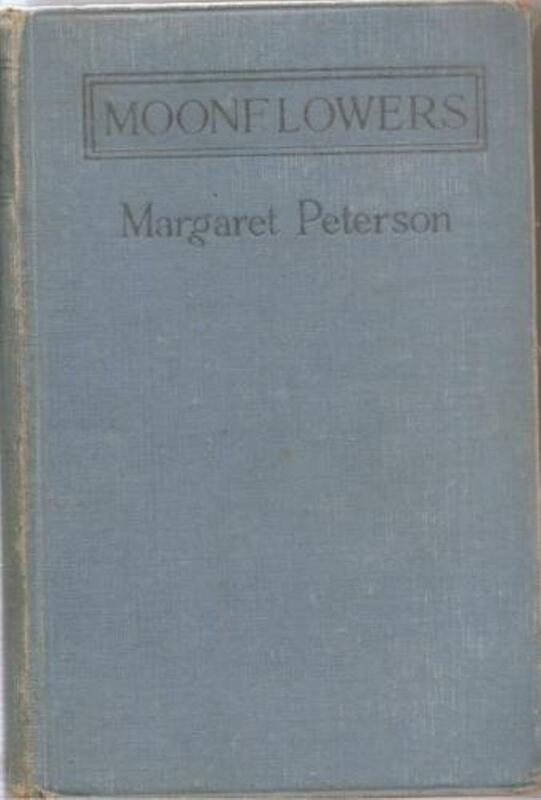 I do not know when the real identity behind the pseudonym was revealed, but the British Museum Catalogue give the authoress as Margaret Peterson. 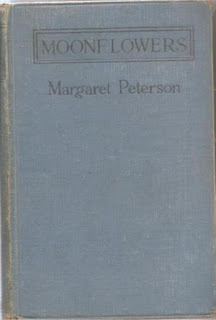 Peterson (1883-1933) was a very successful writer of popular novels for women, most of which are forgotten today. One of her later books, Moonflowers (1926) is set in central Africa and centers upon a murderess whom some firmly believe to be a vampire, while others equally firmly believe her murders are completely non-supernatural. The authoress manages to maintain an ambivalence through the very end of the book, without a firm resolution to one side or the other (though their are hints...). Devil Spider is an engaging and competent detective thriller of its time. 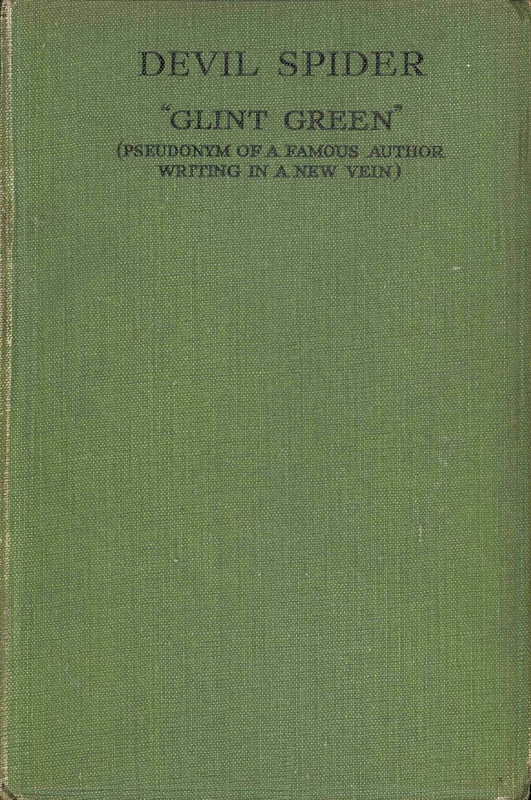 Margaret Peterson's authorship of the "Glint Green" books is not disclosed in her entry for Who's Was Who, nor were the books mentioned in her obituary in The Times (30 December 1933). The U.S. 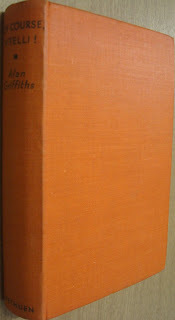 Copyright registers do give the authorship of the "Glint Green" novels as Margaret Fisher, "Fisher" being Margaret Peterson's married name. 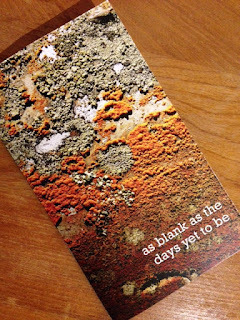 'As Blank As The Days Yet To Be' started as an essay about a piece of folklore, turned into an autobiographical vignette about a visit to a lair of the fabulous beast, and then became a story about an encounter with the quietly singular. The text by Mark Valentine is illuminated by beautiful images from the photography of Julian Hyde. Design and print is by Full Point Design. This new booklet published by Voices in a Lane will accompany an exhibition of Julian Hyde’s images at St Oswald’s Church, Grasmere, Cumbria, from 4-7 April 2017. It is limited to 100 copies and is available for £10 including postage in the UK. Enquire for overseas orders. I first learned of the Henry Holt and Company series of “Books for the Imagination” via an article by A. Langley Searles in his fanzine The Annex #7 (Winter 1989-1990). 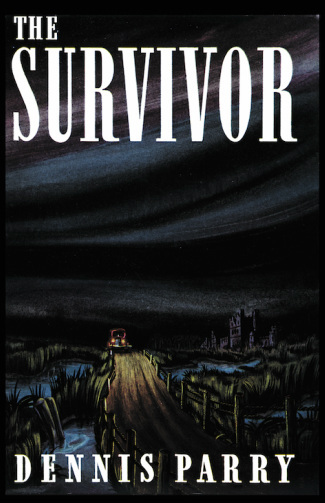 Searles noted that the series began shortly before World War II, and encompassed books such as Past the End of the Pavement (1939) by Charles G. Finney, Windless Cabins (1940) by Mark Van Doren, The Survivor (1940) by Dennis Parry, and Lest Darkness Fall (1941) by L. Sprague de Camp. A little research shows that the situation with this series is rather more complicated. 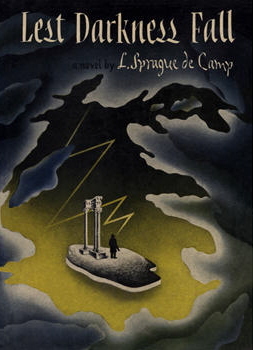 The first book labeled as part of the series was in fact Fletcher Pratt and L. Sprague de Camp’s The Incomplete Enchanter (1941). The earlier titles are listed in the description of the series on the rear cover of the dust-wrapper, even though they pre-dated the series itself. 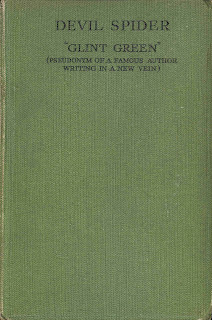 The series lasted for only one more book, Land of Unreason (1942), by Fletcher Pratt and L. Sprague de Camp, which has an advertisement of the series on the rear flap of the dust-wrapper. I give the full advertisement from The Incomplete Enchanter below, followed by an extract from the slightly re-written advertisement on Land of Unreason. Finally, I give details, chronologically, on the six books that make up the entire series. The publication of a book like The Incomplete Enchanter is a somewhat unusual experience. In theme, in plot, in treatment, it falls clean outside the ordinary patterns of contemporary fiction; this very fact is one of the reasons for putting Mr. Pratt’s and Mr. de Camp’s story between book covers. For we believe, as publishers, that there is a substantial body of readers today who welcome books which don’t “conform.” The rare and priceless quality of imagination is a sort of reading vitamin—without it no diet of books is really complete. Too much contemporary fiction seems to us to lack this very quality: the moribund products of historical research, the novels with plots as standardized as the appeals of mass advertising, the books of reportorial sociology dressed up as fiction crowd the booksellers’ tables. Only occasionally is there a story written which is alive with the vitality with a fresh imagination and impact for narrative. We are on the constant lookout for such manuscripts, and it is part of our policy to publish them when they can be found. Already there have been several in our past lists. 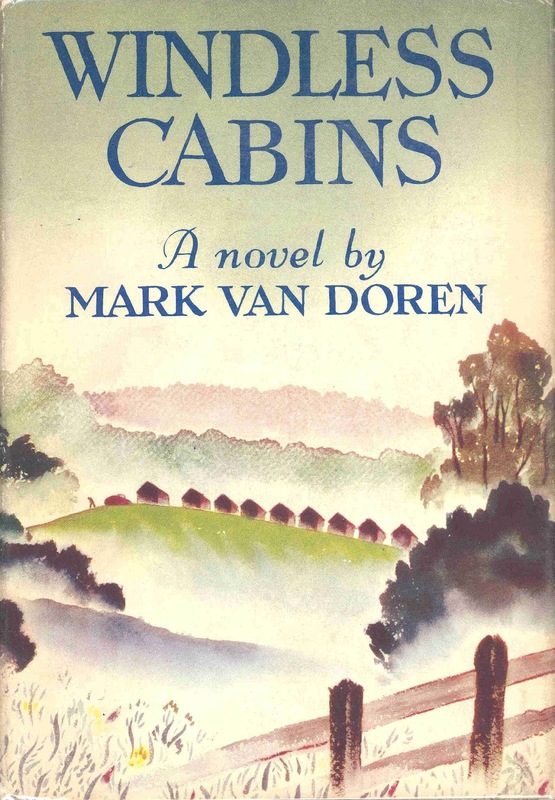 Mark Van Doren’s Windless Cabins, for one, Dennis Parry’s The Survivor for another. L. Sprague de Camp’s Lest Darkness Fall was a third. The experiment has been a successful one. No project has brought in to our offices so many unsolicited letters—or so many manuscripts. One of the most interesting aspects of the publication of this group of books is the way in which people continue to buy and read them long after the usual life-span of a modern book of fiction. They have proved to be stories worth reading long after their initial publication. The Incomplete Enchanter is, we believe, a book for the imagination, for what an earlier day would have called the “fancy.” It is not like any of its predecessors except in this one fact, for the imagination is not a stereotype. Our expectation is that some readers will be wildly enthusiastic, some entertained, and some, perhaps, uncomprehending. But it’s worth trying, just to see whether it doesn’t supply you with a form of reading pleasure you may have been missing . . . .
Books for the Imagination is the informal title we are giving to a series of books we have been publishing for several years. They represent a somewhat unusual enterprise; in theme, in plot, in treatment, they fall clean outside the patterns of contemporary fiction. That is why we publish them. 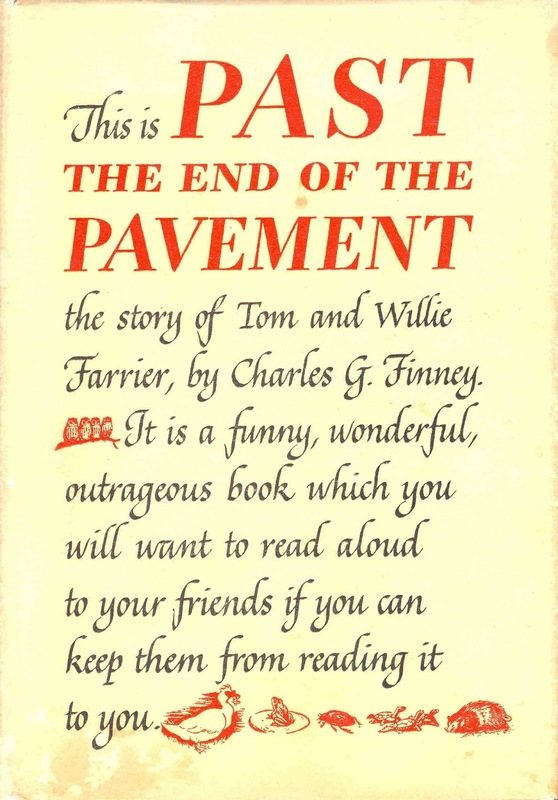 Past the End of the Pavement, by Charles G. Finney. Published 16 November 1939. 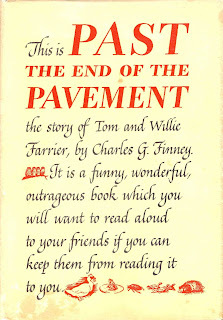 It was retitled This is Past the End of the Pavement for the December 1942 reprinting, with a newly designed dust-wrapper. This novel, though nonfantastic, is perhaps Finney’s best work. Windless Cabins, by Mark Van Doren. Published 20 February 1940. Also a non-fantasy. The Survivor, by Dennis Parry. Published on 21 May 1940. First published in London on 17 April 1940. A supernatural novel, reissued in 2014 by Valancourt with anew introduction by Mark Valentine. Lest Darkness Fall, by L. Sprague de Camp. Published 24 February 1941. 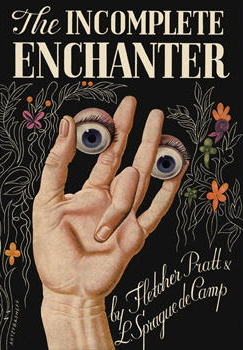 The Incomplete Enchanter, by Fletcher Pratt and L. Sprague de Camp. Published 25 September 1941. 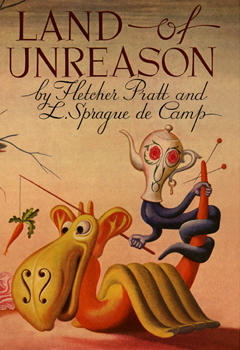 Land of Unreason, by Fletcher Pratt and L. Sprague de Camp. Published 15 June 1942. As a long-time reader of forgotten books, I should know better than to let myself get my hopes up. Many obscure books are forgotten for one of a great variety of reasons—it’s not that they are irredeemably bad books, or that they aren’t worth reading for some qualities, but they are often flawed in some ways. Yet when I read a review written by Jorge Luis Borges of Of Course, Vitelli! (1938) by Alan Griffiths (1899-1950), I did get my hopes up. Of Course, Vitelli! 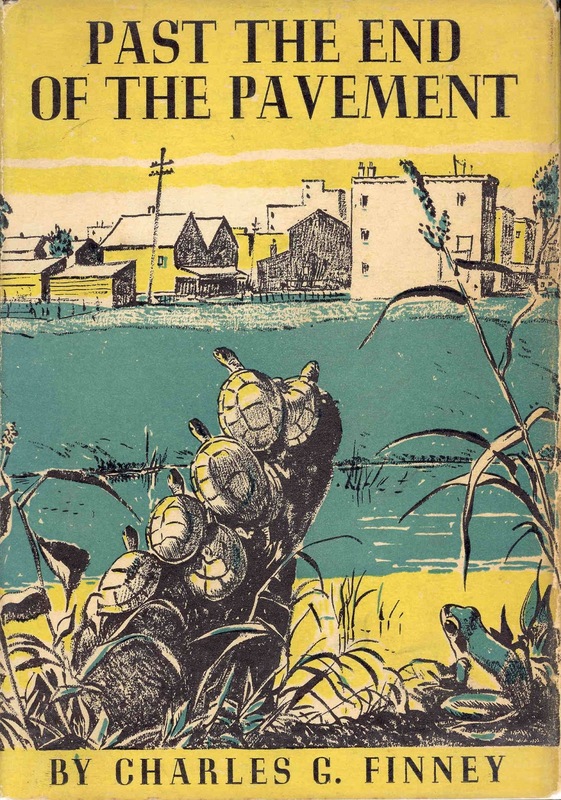 was the fourth and final novel by Griffiths, the first three of which are Thorne Smith-type books, comedic farces of a type which has never interested me. The sad truth is that Borges has simplified and altered the details of the plot. Diss’s anecdote involves the imaginary Vitelli, whom no-one recognizes initially. Diss doesn’t write an article in a magazine, but publishes a letter in a local newspaper requesting further information on Vitelli. It’s only in a weak moment that Diss considers revealing the hoax, but he is dissuaded by one friend who is also a participant in the hoax. In fact Diss ends up being put on trial for perpetrating the hoax. There is no nephew of Vitelli, and there is no character named Clutterbuck Vitelli. Whether Borges kept bad notes or deliberately altered the details is anyone’s guess. Of Course, Vitelli! is basically just like Griffith’s three previous novels. It is an extended farce—a farce of the local Suffolk gentry, of spiritualism, of tabloid newspapers, of publishing, and of modern film making. Diss’s biography, Vitelli, the Magyar, tells of Michel Vitelli, castrated as a young boy in an attempt to stop his voice from falling, and his ill-fated love for Miss Amy Folkard. Diss’s book is being made (quite appropriately for a farce) into a modern musical film starring current celebrities as The Loves of Vitelli, which plays as loose with the book’s facts as Diss played loose with his own imagination. Production on the film is halted when Diss is put on trial “for conduct subversive to the public interest,” and the trial ends after Mr. Raffelo Vitelli shows up and claims that Vitelli was his mother! Of Course, Vitelli! is not, as Borges said, “extremely entertaining.” It is an improbable farce that is carried on long beyond the reader’s threshold for boredom. Perhaps it was Borges's joke to make it sound more interesting than it is. Seventy years ago, G W Stonier (1903-85) wrote a short experimental novel called The Memoirs of a Ghost (1947) which is one of the more unusual attempts to devise a modern, contemporary ghost story. 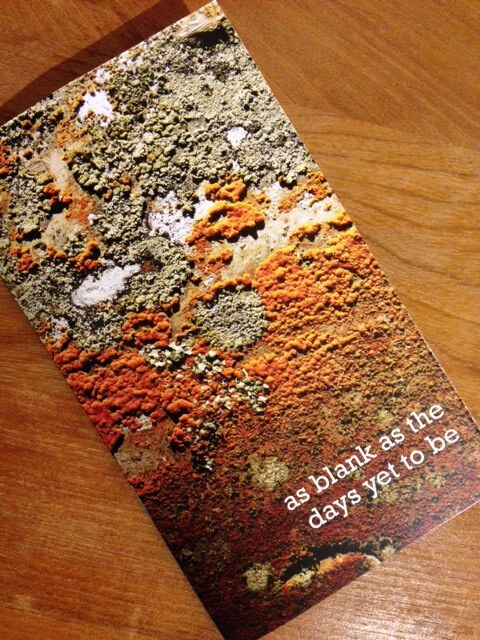 It was published by the Grey Walls Press, an independent imprint set up by the poet and editor Wrey Gardiner from his mother’s house in Billericay, Essex. The narrator, we lean early on in the novel, has been killed in the Blitz. But he continues to exist. We witness his halting re-emergence after the bomb blast, confused and assailed by pursuers. Then, in a scintillant, lyrical set of soaring pages, he appears to rise above the earth and to witness the vital forces of nature in all their majestic shapes and contours. But this episode does not last. Soon he is back in the dingy, semi-derelict streets of the city, and surrounded by rough, very definitely down-to-earth characters. He is never able to rest, eat or drink properly, though he still feels the need to do so. The narration is fractured, spasmodic, frequently shifting scene, as it might be in a dream, or nightmare. However, very gradually he resumes a similar life to the one he has supposedly left. But it requires considerable psychic effort to continue to cohere. Sometimes he becomes spiritually exhausted, and begins to lose his hold on the recreated life: at others he feels on the brink of a fundamental revelation. I think Bleiler was right to detect some element of social allegory in play. However, this does not seem to me the main thrust of the book. It is perhaps foremost a genuine attempt to explore what a certain sort of after-life might be, with a worked-out sociology and psychology of the ghost. His narrator is scornful of the traditional type of ghost, “wearing armour or clanking chains, and extending a luminous claw”. We should be looking instead, it is implied, at the figures we see every day on the street. The narrator tells us that “The ghost is gregarious and a creature of habit”, but he is also limited: “Habit, I found,” he tells us, “restricts his imagination to the experience of a lifetime.” He cannot suddenly depart from the parameters of his previous world. Also, his existence is tenuous: “The ghost, unhappy wretch, lives on his immediate energy; he must draw the lines of every perspective, mould every curve, distribute form, animation and colour". It is an “unremitting” struggle: “I lived by inches,” he tells us. Perhaps we see here an allegory about how we sustain our own individuality and continue our search for meaning in this world, seen as a perilous task requiring constant energy and vigilance. Stonier’s book belongs in the sphere of modernist literature. The restless, allusive, splintered response to the city has qualities in common with T S Eliot’s ‘The Waste Land’, for example, or ‘Rhapsody on a Windy Night’, with its nocturnal exploration of memory “through the spaces of the dark”. It also has some similarities to the modernist short stories and novels of Mary Butts, particularly in the mingling of the mortal world with other dimensions, and the displacement of time and space. As a fantastical evocation of the Blitz, one of the few works with which Stonier’s distinctive book has some points in common is Rex Warner’s Why Was I Killed? (1943). This book is sub-titled “a dramatic monologue”, and this suggests both its strength and its weakness. As a searching discussion of the causes and effects of war, it has an earnest authority to it which compels respect. But as a work of fiction it is less successful. There is, nevertheless, a strange atmosphere to Warner's book which makes it worth perseverance. Stonier’s work is much less didactic than this, but belongs to the same tumultuous, charged atmosphere of the Blitz years, and has an equally evident serious purpose. It is more ambiguous and exploratory, and gains from this less closed approach. It is also more focused, since we are in the presence of the single narrator throughout. Stonier’s work is more successful than Warner’s in establishing a plausible, compelling new plane of existence. As well as the short novel, he also wrote a short story with the same title which appeared in The Second Ghost Book (1952) edited by Cynthia Asquith. This appears to be a variation on an extract from the book: however, as Bleiler notices, there are several divergences in detail from it. Possibly Stonier may have thought the longer work had not quite had the notice it should, and reworked part of it for this new readership. Otherwise, the author of The Memoirs of a Ghost never wrote anything else quite like it. Much of his other work is largely that of the professional writer, willing to try out publishers with various ideas. He did also write about London and the bombing in Shaving Through the Blitz (1943), a memoir, and Round London With The Unicorn (1951), a pub crawl. Perhaps the nearest to the supernatural Memoirs is The Shadow Across the Page (1936), a sort of commonplace book of isolated brief paragraphs recording unusual sights, facts, overheard conversations, impressions. Some of these have a strange, eerie or macabre quality similar in tone or perspective to The Memoirs of a Ghost. 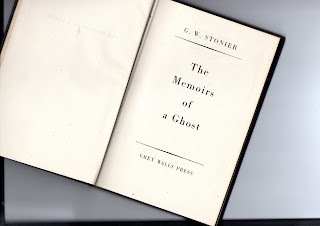 There are still many dimensions of the ghost story yet to be explored, and I think that Stonier’s book gives some indications of where there is still room for a dramatically different approach. It certainly will not be to everyone’s taste, particularly those who prefer a more traditional style and an antiquarian theme. But I hope that the integrity of the work, its thoughtful dimensions, and the illumined quality of its prose experiments would be recognised even by those not naturally drawn to it.